KNDL is now on twitter!! Keep up with all the latest KNDL news on our twitter feed. The Koester NanoDevice Laboratory is a research group in the Electrical and Computer Engineering (ECE) Department at the University of Minnesota. Our group mission is to research new solid-state electronic and optoelectronic device concepts. Our current projects involve: (1) graphene quantum capacitance varactors for wireless biosensing applications, (2) silicon-based wireless radiation sensors for use in cancer therapy, (3) photonic devices made using two-dimensional materials, (4) all-spin logic, and (5) tunneling field-effect transistors for ultira-low-power logic applications. Our research projects are supported by the National Science Foundation (NSF), the Nanoelectronics Research Initiative (NRI/SRC), the National Institutes of Health, and the Minnesota Partnership for Biotechnology and Medical Genomics. 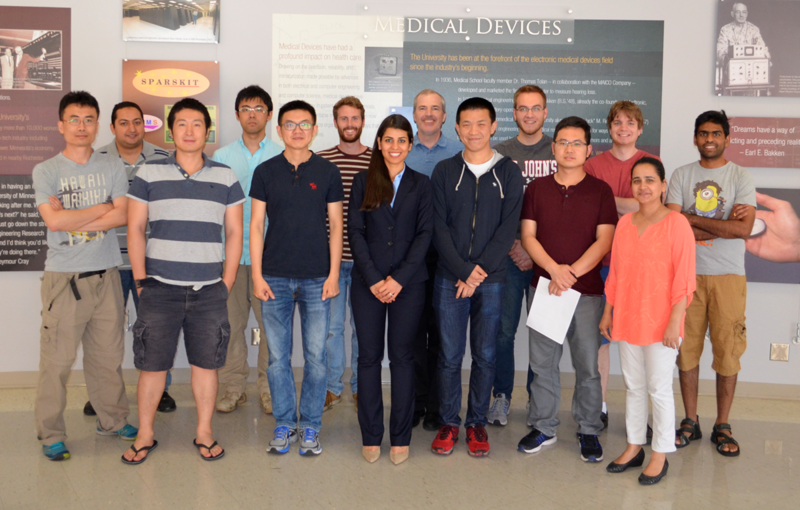 The Koester NanoDevice Laboratory pursues its research goals through theoretical analsyis, device design and simulation, process development, fabrication, and characterization. We fabricate our own devices in the University of Minnesota Nanofabrication facility, but also have numerous collaborations with research laboratories around the world.